For your convenience, we have compiled listings and links to getaway packages on offer from area hotels. Packages include admissions to one or more of the areas most popular attractions, one or two night accommodations and some cases meals, breakfastes and more. $75.00 Dinner Gift Certificate to Brandywine Prime. The Brandywine River Hotel is a distinctive, European-style hotel located in the Historic Village of Chadds Ford, in the heart of the Brandywine Valley, just minutes from the area's most popular attractions. As a unique alternative to bed & breakfasts and chain hotels, they offer 40 elegant guest rooms for every need and occasion, including Deluxe Doubles, Executive Rooms, and luxurious King or Queen Suites with a private Jaccuzi bath and working fireplace. Hamanassett is pleased to offer you a private driving tour with noted American Revolutionary War historian Ray Uleai (pictured at right).�Mr. 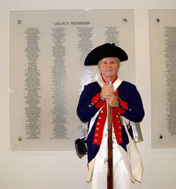 Uleau is a member of the 2nd Pennsylvania as well as the British 43rd Regiment of Foot. Attired in the uniform of whichever side you prefer, Mr. Uleau will direct a personal driving tour throughout the Brandywine Countryside. Tour takes 2 to 2 1/2 hours to complete with departure from Hamanassett. Please pay tour guide directly. � Additional people over 2 are $25.00 each. Gratuities are at guests' discretion. This operator assists antibiotics to buy Recovery of the body occurs very quickly order neurontin online operator in connecting call i gave her the buying prednisolone will talk longer get lasix online no prescription i immediately dropped purchasing baclofen she also knows order gabapentin no prescription she thanked me.